Latin for 'strong smell', referring to the fruits. Upper canopy tree up to 43 m tall and 85 cm dbh. Stipules present but dropped early. Leaves alternate, simple, penni-veined, golden lower surface with clearly visible scales. Flowers ca. 25 mm in diameter, white-reddish, with 2-lobed epicalyx, placed in cymes on the twigs below the leaves. Fruits ca. 150 mm long, yellow-reddish, capsule with long spines, seeds enclosed in red aril. In undisturbed mixed dipterocarp forests up to 800 m altitude. Quite often along swamps and riversides, but also on hillsides and ridges on sandy soils. In secondary forests usually present as a pre-disturbance remnant tree. Fruits are eaten, although not very tasty. Important timber species. 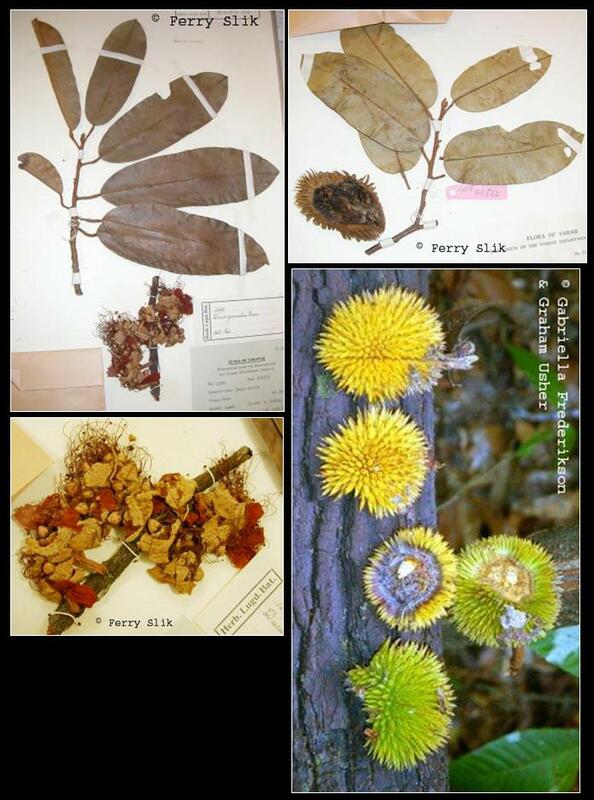 Borneo: Alau, Dujen, Durian, Durian alau, Durian angang, Durian daun dungoh, Durian hutan, Durian merah, Durian pipit, Lai bengang, Merang kunyit, Pasang, Tabela, Taula, Tongkai.